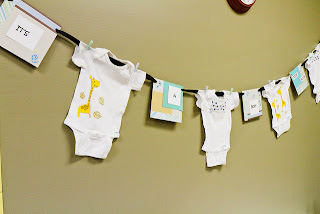 While googling a "how to" for a current project I am working on, I stumbled across this neat-o, easy project from FreeKidsCrafts.com. I think this is a project that THE BOY, THE GIRL and I will do today for our arts and crafts lesson. The bonus? I have all of this stuff onhand! I love to get stuff by winning it--although it hasn't happened too often. for her Elmer's giveaway she is hosting. People, places, friends, family, traditions, status, and everything CHANGES, but in all things, JESUS is still the same....so there is always a reason to be thankful. Here are a few things this week that you can gaze at, recreate or use for fun! ﻿﻿I can't believe next week is Thanksgiving. I am excited/scared because I will be making a turkey this year....a whole one.....(I made a turkey breast years ago and burnt it, so fingers crossed this won't burn). I have joined the Pinterest site and have been busy uploading my fave pics to it. It gets pretty addicting. Wow! I'm still in my pj's? ﻿We are hosting the Main Dish for the church youth group tonight....so now I am off to chop and prepare for a taco/burrito bar! AND.....we finally finished the main work on the church building and we are all moved IN! Yay! I am looking forward to a GREAT Friday! Make a to do list. It will keep you on task, help you finish what you start, and remind you what you need to do next. For fun, check out To Do List blog and see the lists that she has compiled. 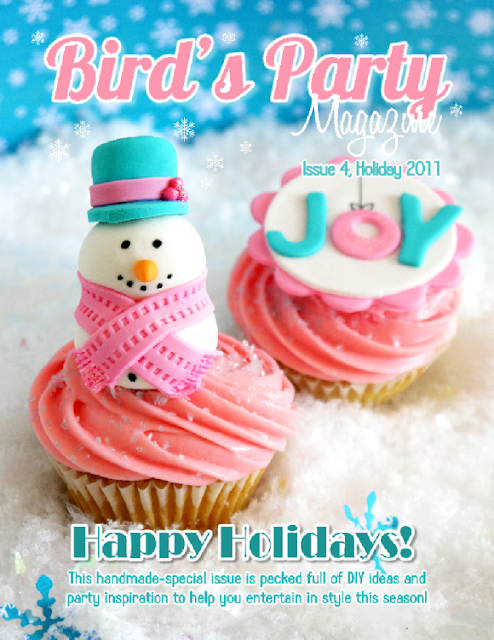 Bird's Party puts together a magazine stuffed FULL of pics and great ideas for parties. They just came out with their December issue and you can view it online for FREE or buy it as well. 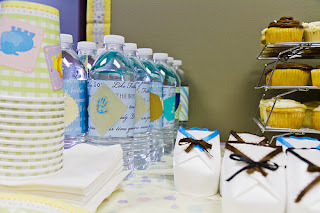 Check out Bird's Party for great party ideas! As I sat staring at my handful of snack size Snickers to take to my pal Shelly in the hospital after having her baby, I thought "I can't just take her a handful of Snickers....how can I dress it up?" So....in a dash...literally 15 minutes I made this. Here is a quick HOW TO in case you wanna do it. Once I started, I realized I wasn't going to make just one flower...so I added more candy. It helps to have an audience while you make these. THE GIRL also helped take pictures as did THE HUSBAND. Next, take your dowel rod, or whatever you are using for to support the heavy candy topper and wrap it with ribbon. Again, I taped the stick to the flower.....WRONG...keep reading. At this point, I realized that I needed something to stabilize the candy bars to keep them from flapping forward. Floral wire worked great and glued it to the circle cardstock behind the candy. Then I taped the candy bars to the wire for support (this is the back of the flower). I hot glued the smaller circle to the front...again careful not to melt the candy. I completed a second version with Twizzlers. Then, THE GIRL taped individual candies to floral wire and we used those as a filler. The tootsie rolls at the bottom are brown...just like soil. One way to save money is to sign up for free samples. 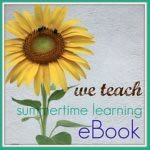 There are so many wonderful blogs out there that advertise the links for these free samples. Just be wary of the ones that require you to sign up with a credit card. Those obviously aren't free. Bloggers: Want 50 free Tiny Prints Christmas Cards? Go to Tiny Prints and sign up to get your 50 free Christmas photo cards! Feature Tiny Prints Christmas Cards! It might seem early, but holiday season is upon us and we are beyond excited to share our 2011 Christmas and holiday card line with you and your readers. Once again Tiny Prints has designed an irresistible line of holiday photo cards and we want nothing more than to share them with you. We are looking for bloggers interested in featuring our Christmas or holiday cards in exchange for 50 cards from the 2011 line. It has been SOOOO busy around our house and church lately that when I woke up Saturday morning and didn't have any files to type (I transcribe for a psych hospital on the weekends) I felt a surge of energy to oddly bake and clean. First on the list was: CLEAN. I had my staff children stay busy with chores helping me around the house. I pulled out an old recipe that wasn't so great the first time I made it, (I lacked an ingredient), so I figured i would try it again. **This was kinda bland by itself, but topped with sour cream wasn't too bad. I would switch to garlic salt instead of the powder and this will probably add more pizazz. Also, I added some browned hamburger meat, and probably should have added more spices....so if you add hamburger, mix taco seasoning with your meat. Also, I had THE GIRL start a box (yes a box mix) of sugar cookies. We needed to go meet the new neighbors and our previous batch of "from scratch" cookies were BAD. I needed reassurance that I wasn't wasting ingredients. Then THE BOY and THE GIRL and I (with aprons on) rolled out the dough and shaped our cookies. Then onto the cinnamon rolls. What a productive day it was and it was really great to have the kids help and create memories together. 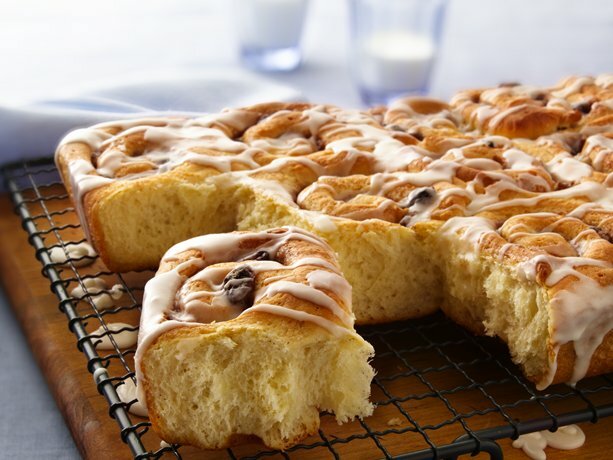 I thought I would share my cinnamon rolls recipe (c/o Betty Crocker) with you. The last time I made cinnamon roll dough in my bread machine, they tasted too yeasty, so I made these by hand. Also, you can use the dough and make sweet rolls, or something else instead of cinnamon rolls. Dissolve yeast in warm water. Stir in milk, sugar, salt, eggs, shortening and 2 ½ c flour. Mix in enough remaining flour to make dough easy to handle. Turn dough out and knead until smooth and elastic about 5 minutes. Place in greased bowl. Turn greased side up. Cover, let rise in warm place until double, about 1 ½ hours. Punch down dough and roll out onto floured surface. Roll out into large rectangle. Generously add the pieces of butter. Sprinkle entire surface with sugar and cinnamon. Roll from the top to the bottom to create a large log. Cut into 2 inch slices. Place in 13x9 pan. Sprinkle with remaining sugar and cinnamon from your surface. Let sit until doubled in size again. Bake 375 for 25 minutes. Stir onion, spices, green pepper, tomatoes. Layer tortillas on bottom of crockpot. Scoop onion/tomato mix and add to tortillas. Next add beans, then cheese. Repeat layers. Top with cheese. Cover and cook on low 6-7 hours. Be THANKFUL for your spouse. We tend to take for granted our spouse, and sometimes forget the many wonderful things that they do quickly. One way to get your day off to the right start, and to start the day with positive feelings about your spouse is to write down 3 things each day that you are THANKFUL for in your spouse. Use a small notebook, or something to keep yourself accountable for this DAILY thankful list. Here is my THANKFUL list for today. 1. I am thankful that when my husband is up earlier than I am that he is quiet and is considerate so that I can still sleep. 2. I am thankful for the wonderful father that my husband is. 3. I am thankful that my husband moved the couch into the garage without my help. With warm fuzzies flowing for your spouse, your attitude will be better and it will remind you of the reason you married your spouse! 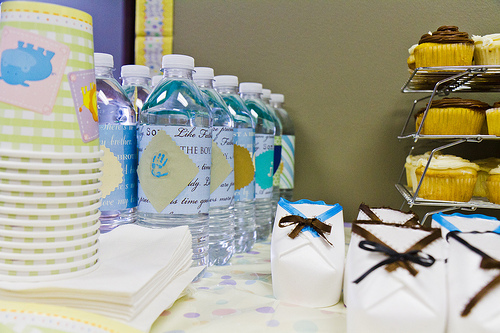 Saturday, we had a fantastic time at church showering two new mama's to be with a baby shower. 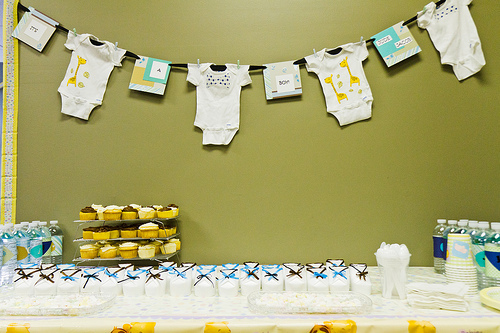 My pal Kim and I were in charge of the decor and "stuff", so that meant scouring the Internet for ideas. 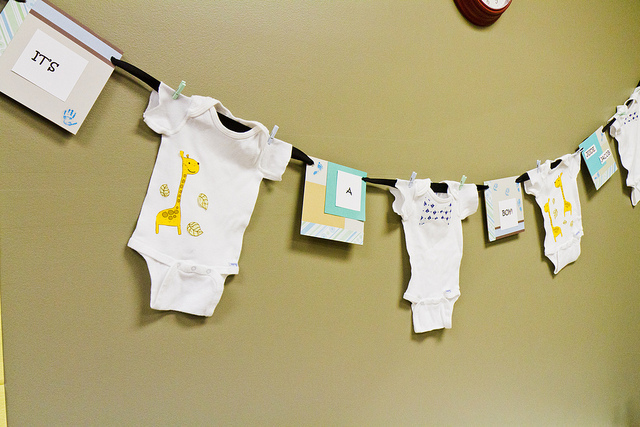 I saw these adorable booties at Beneath My Heart and had to make it. Here is a quick tutorial if you need to make one.